When you go to a work event or conference, I'm sure you are already putting some thought into what you wear or pack. There are actually some ways I have found to use my wardrobe to maximize my experiences when I'm in settings amongst fabulous creatives (where I may otherwise just blend in). This February I attended The Southern C Summit with some great gals (like Erin of Pinckney Palm, hanging with me below). 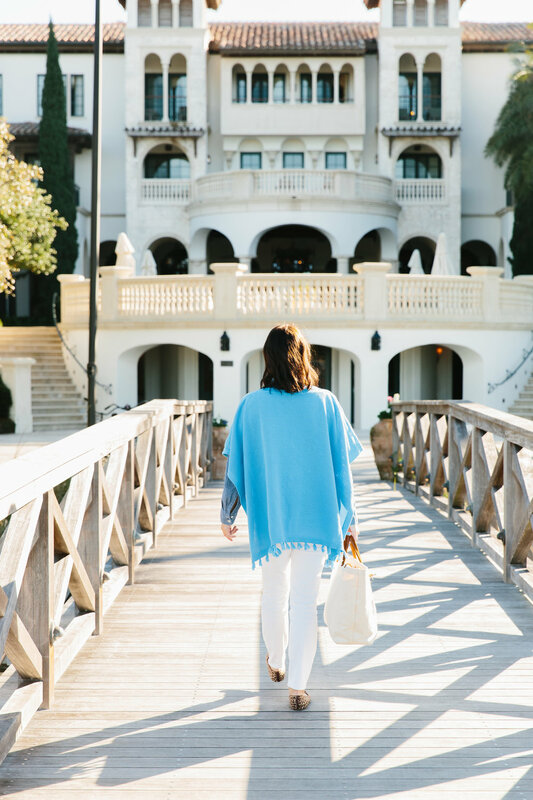 J. McLaughlin graciously styled us with some of their latest looks for our Sea Island conference, and I hope you glean something from these tips that I will take with me on future conferences. It was by happy accident that I discovered this no-brainer idea. On our last morning I was heading to two different events, and having another pair of shoes, etc. with me was a more efficient option than making an extra trip back to my room. I always have my weekender bag from my online shop with me, so I packed up my essentials to transport my things to brunch and guess what? I got two orders on the spot, and also got some cute pix with some really adorable bloggers holding my bag. If you don't happen to have apparel, I bet you can still think of a savvy way to show off your work. I ran into one conference attendee that was wearing a gorgeous maxi, which was actually a print she did the graphic design of. She wasn't even in textiles, but what a great idea to be a walking advertisement for your work. If you're an artist, hand paint a cheap clutch from Target or pair of flats. Or, if you are a service based business, why not wear a t-shirt with your logo? Just pair it with a blazer or statement skirt and you will start some conversations. When you're surrounded by stylish creatives, it's natural to start a conversation based on fashion. This is obviously only going to happen if you are wearing something fun and awesome! Learn how to accept a compliment, and also how to take it as an opportunity to bring up what you do. "Thanks, I love promoting southern brands like this on my blog" or "this color is my best seller of Turkish towels" or even just "let's make a Pinterest board together since we have similar taste!"... you get the idea! Seriously though, I bet half of the conversations I've had at conferences wouldn't have happened if I had just been wearing jeans and a t-shirt. I always try to bring some statement pieces with me that reflect my brand aesthetic or are just plain fun. In my opinion you can never go wrong with tassels, pom poms, bold sunglasses, or statement jewelry. 3. Bring Your Play Clothes! The next time I go to a conference I will be sure to stay an extra night to make time to really settle in and have more time to play; can you think of a better way to connect with other entrepreneurs than riding bikes or taking a stroll around town? Even if all you have time for is a dinner out together, try to gather a group besides just your roommates to hang out during the down time. Erin and I had dinner with our roommate Emily of Suite 33, and joined some gals from Leapfrog PR & Schermer Pecans. We also found the ladies from Hermosa Jewelry, Humanite Boutique, & Zags sun wraps on the dance floor one night. We certainly won't forget each other any time soon! I highly recommend pulling the trigger on the next The Southern C Summit or any conference you have been reticent to invest in. The Summit has almost already paid for itself in new customers, media contacts, blog clients, and other potential leads- not to mention it was priceless for me to get to meet my long-time Instagram idol Gray Malin!